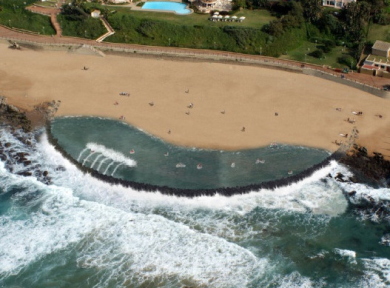 There is an interesting story doing the rounds about the proposed development of a tidal pool on Umhlanga’s main beach. The expected cost is about R26.7million and as is always the case with proposals of this nature, there are two conflicting views. The mock-up image that appeared in the weekend papers make it look spectacular and people will no doubt come from far and wide to enjoy the beach without having to face the inherent dangers that come with swimming in the surf. The image reveals that the size of it is massive and it looks as though it will be built on the rocky outcrop area between the pier and the lighthouse. Locals are vehemently against it citing lack of parking in the area among their chief concerns. I suspect that many, albeit they wouldn't admit to it publicly, simply do not want the exclusivity of their upmarket beach town being affected by an influx of people. “At a time when this very same department is warning of climate change, shifts in high water levels and a need to remove hard structures from our beaches, it prepares to spend R26m on a pool that could very well be washed into the sea by storms,” said De Boer. He further stated that that the project appears to be obscenely expensive. This past weekend’s Sunday Times indicated that eThekwini Municipality believe that the beach is eroding away and that the tidal pool would assist in protecting the beach from it. Based on visual evidence from the perspective of an individual who enjoys walking along that beach, perhaps eThekwini have a point.